The purpose of Apple’s Limit Ad Tracking (LAT) feature is to improve user privacy. In iOS 10 Apple decided to toughen up its LAT stance, sending a string of zeroes in place of the user’s IDFA when this feature was activated. Therefore for iOS 10+, LAT users’ IDFA can not be used for any purpose, including attribution. 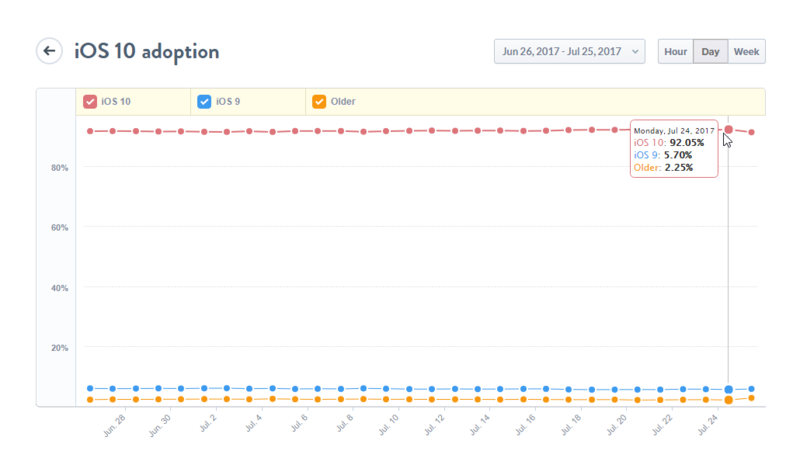 More than 90% of iOS users have now switched to iOS 10, including around 15% of users who have activated LAT. Therefore, it is expected that 1 out of 5 iOS users will be a LAT user soon. 99% of media sources and 100% of custom tracking links for owned media use tracking links. LAT obviously affects attribution companies’ ability to track installs using ID matching. The loss of 15% of attributed installs could be very troubling for app owners using these tracking links. Luckily, a fallback mechanism for ID matching can be used - fingerprinting attribution. It uses publicly available parameters (i.e. device name, device type, OS version, platform, IP address, carrier, to name just a few), to form a digital fingerprint ID that statistically matches specific device attributes. As such, fingerprinting is less accurate than ID matching, and therefore the attribution window is short, usually 24 hours. In mobile app install campaigns, the vast majority of first app opens occur within 1-2 hours, in which case the fingerprinting method is extremely accurate. However, some loss of attributed installs is unavoidable. Assuming 15% LAT and 90% fingerprinting accuracy the best case entails a loss of 1.5% attributions, so the effect on these media sources is not dramatic. Advertisers actually gain somewhat from this. When advertisers run on a cost per install (CPI) pricing model, and not on exposure (CPM) or clicks (CPC), they receive 1.7% free organic installs! What happens when a LAT user clicks on an ad served by a media source that relies solely on ID matching - among them top sources such as Facebook, Google and Snapchat? When that user installs and launches the app, the mobile attribution company’s SDK cannot pull its IDFA, and so the media source is unable to perform ID matching and identify the user as their own. This results in a failed attribution and a free organic user for the app owner. This is true for CPI and CPA campaigns only, as media sources need to carve out their installs quota out of the 85% non-LAT users only, but still may serve ads to the 15% LAT users for free. This is a potential increase of about 17.6% (100/85) free installs for advertisers. It makes sense that these giants of mobile app advertising would soon reach a solution to minimize the effects of LAT on them. For example, such a solution could be to simply stop serving LAT users with mobile app install ads, or by implementing some fingerprinting API. In conclusion, on CPI or CPA campaigns, media sources that do not support fingerprinting may contribute up to 20% free installs to app owners. To fix broken app discovery and increase user intent, Apple Search Ads is a new and powerful source for paid installs for iOS app owners. In contrast with all other mobile media companies, Apple knows exactly who its mobile users are, even if they’re LAT users, since it can easily use the iTunes account ID. Apple search ads' attribution is therefore unharmed by LAT users, while AppsFlyer sees them as organic users. However, audience targeted Apple Search ads campaigns don’t serve ads to LAT users, so the problem is confined to non-targeted campaigns only. In conclusion, non-targeted campaigns on Apple Search Ads may bring a high percentage of non-attributed users. The surprising conclusion from this analysis is that the introduction of LAT on iOS 10 has actually increased the percentage of non-organic installs app owners receive! On AppsFlyer's data the added installs are unattributed and appear as organic installs. Media sources that do not use Fingerprinting like Facebook may contribute up to 20% free "organic" users, but don't count on it. Targeting in Apple Search Ads installs campaigns is very important, as without it, many paid users are not attributed. As demonstrated, although Apple’s LAT is good for app owners, it has the potential to harm ad networks’ bottom line by forcing them to expose mobile app ads to more users than previously needed. The good news is that when mobile installs are tracked by an attribution company with a good fingerprinting solution the effect of LAT is rather marginal. Android has a similar limitation called "Opting out of ad personalization". However, currently this Android limitation doesn't apply to mobile app attribution, and so there's no effect on android app owners.